What is white and red and black all over? Carmen Marc Valvo's Spring 2017 collection reminded me of a childhood riddle with its streamlined color palette. I interned for the designer wayyyy back in my Parsons days studying fashion design. Back then, it was all about evening wear. 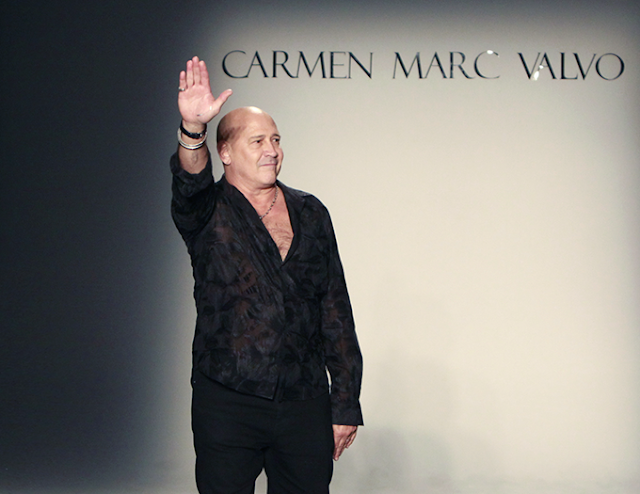 This season, Valvo showed clean, updated looks in evening wear, day wear, swimwear, and menswear. The theme of stripes, luxury fabrics, and delicate flowers was consistent across all categories. 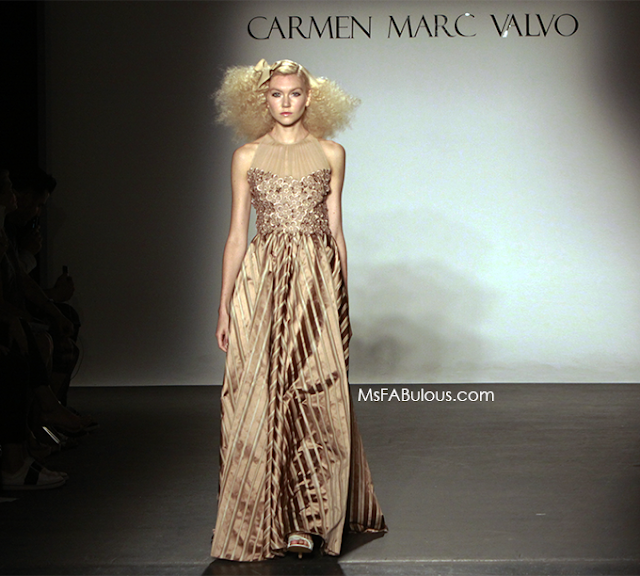 The Carmen Marc Valvo looks from my intern days were perfect for the opera, red carpets, simple weddings. Today, the long dresses could do that, but shorter dresses could take you to more casual destinations. While some silhouettes were structured to be formal-appropriate, other pieces had more relaxed fits. The separates could be dressy or could be your statement piece paired with jeans. Fashion rules had relaxed and been updated. 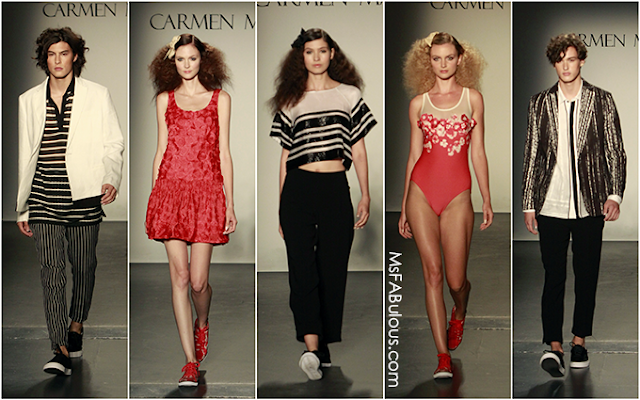 Instead of satin strappy heels, runway looks were accessorized with sneakers and color coordinated flat sandals. Both men and women were styled with curls. On the gents, loose curls were favored, but on the female models, the hair was sleek at the crown with full doll curls for the rest, styled with a bow. The women's hair was cute but seemed a bit at odds with the more updated, relaxed look of the shoes and clothing. It is funny that so many of my dearest friends and colleagues in the industry have all worked or interned at Carmen Marc Valvo at some point. I don't know if he attracts like-minded people or it was just a coincidence. I wonder if the team behind his Spring 2017 collection will also find themselves close friends 20 years from now too? Oh, the answer to the riddle? Take your pick: A) an embarrassed zebra or B) Make it a pun by substituting "red" for "read", making it a newspaper.